Peaches, like apricots, demand to be eaten when perfectly ripe, but because they bruise so easily, they are frequently picked when they feel like baseballs. Set aside, they will mature, but you can’t expect the peachiness of a ripe picking. Keep an eye out for those—you’ll know them by the scent. Lesser peaches can be grilled, however, with excellent results. Preheat the broiler if you plan to use it instead of the grill. Rinse the peaches, pat dry, cut in half, and remove the pits. Place the peach halves in a baking dish. Mix the sugar and cinnamon, stir in the oil, and brush the mixture over the peaches. Sprinkle with the rosemary. Marinate for 10 minutes, turning over and basting once. 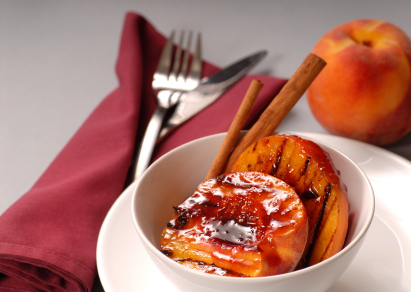 Broil or grill the marinated peaches for 2 to 3 minutes on each side, until they are tender but not soft. Serve immediately, alone or with a scoop of vanilla or cinnamon ice cream.